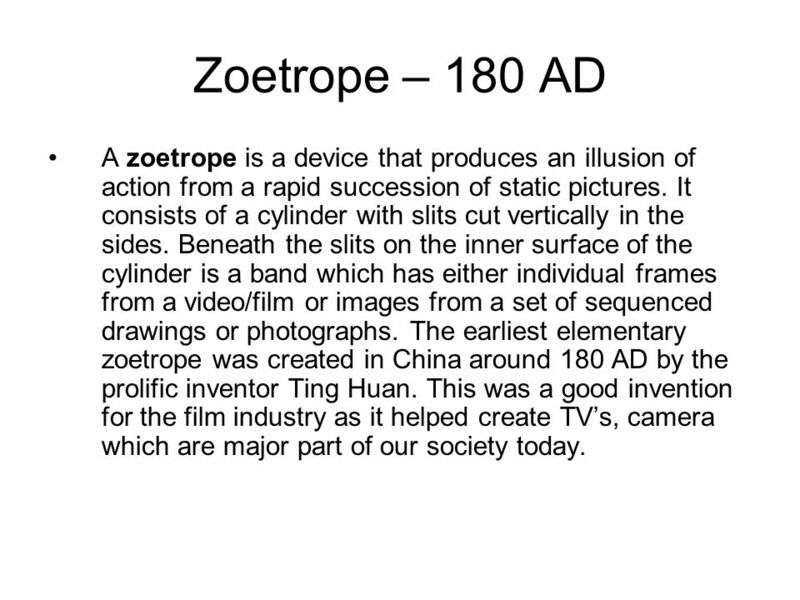 Zoetrope – 180 AD A zoetrope is a device that produces an illusion of action from a rapid succession of static pictures. It consists of a cylinder with. 1 Zoetrope – 180 AD A zoetrope is a device that produces an illusion of action from a rapid succession of static pictures. It consists of a cylinder with slits cut vertically in the sides. Beneath the slits on the inner surface of the cylinder is a band which has either individual frames from a video/film or images from a set of sequenced drawings or photographs. The earliest elementary zoetrope was created in China around 180 AD by the prolific inventor Ting Huan. This was a good invention for the film industry as it helped create TV’s, camera which are major part of our society today. 2 Microscope - 1200 A microscope is an instrument for viewing objects that are too small to be seen by the naked or unaided eye. 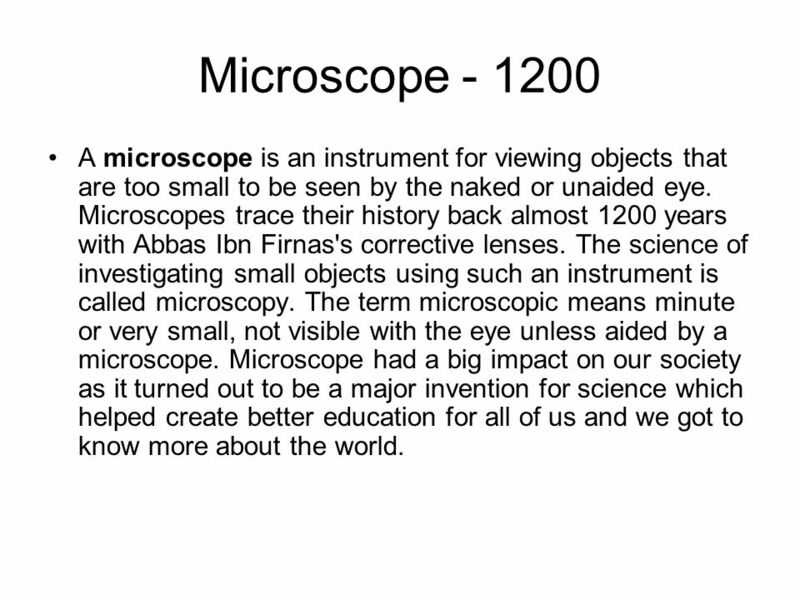 Microscopes trace their history back almost 1200 years with Abbas Ibn Firnas's corrective lenses. The science of investigating small objects using such an instrument is called microscopy. The term microscopic means minute or very small, not visible with the eye unless aided by a microscope. Microscope had a big impact on our society as it turned out to be a major invention for science which helped create better education for all of us and we got to know more about the world. 3 Spring Clock - 1430 The earliest existing spring driven clock is the chamber clock given to Peter the Good, Duke of Burgundy, around 1430, now in the Germanisches Nationalmuseum. 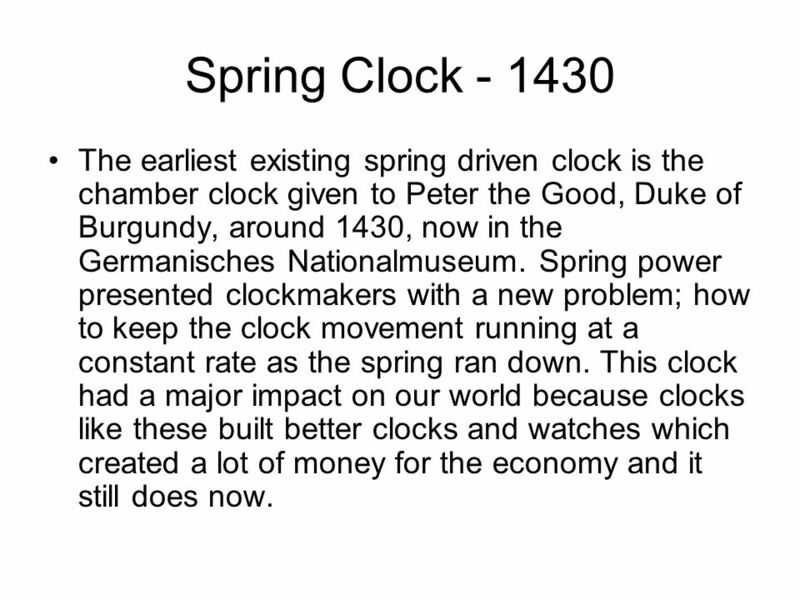 Spring power presented clockmakers with a new problem; how to keep the clock movement running at a constant rate as the spring ran down. This clock had a major impact on our world because clocks like these built better clocks and watches which created a lot of money for the economy and it still does now. 4 Optical Microscope - 1590 The optical microscope, often referred to as the "light microscope", is a type of microscope which uses visible light and a system of lenses to magnify images of small samples. Optical microscopes are the oldest and simplest of the microscopes. 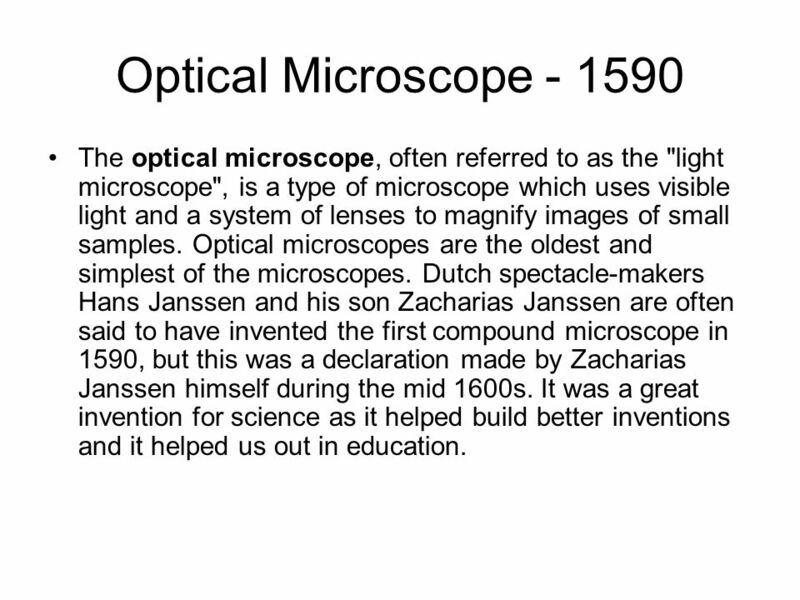 Dutch spectacle-makers Hans Janssen and his son Zacharias Janssen are often said to have invented the first compound microscope in 1590, but this was a declaration made by Zacharias Janssen himself during the mid 1600s. It was a great invention for science as it helped build better inventions and it helped us out in education. 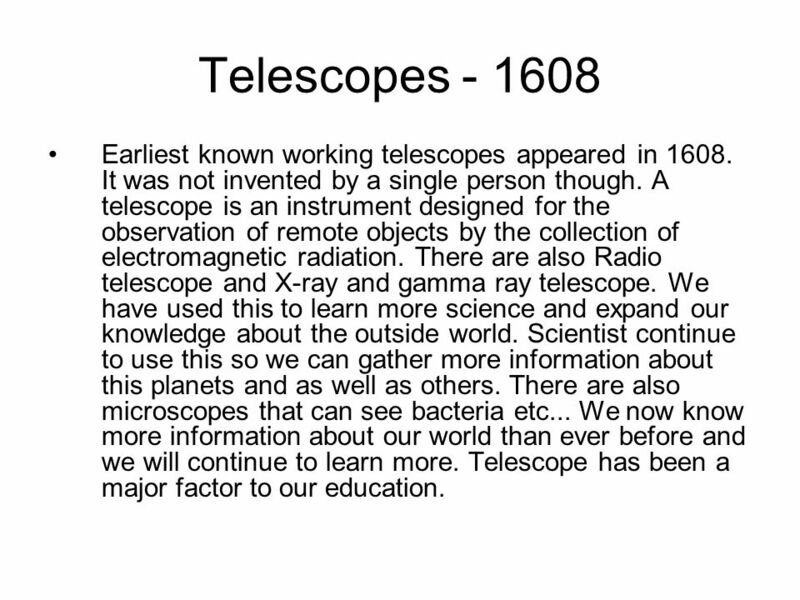 5 Telescopes - 1608 Earliest known working telescopes appeared in 1608. It was not invented by a single person though. A telescope is an instrument designed for the observation of remote objects by the collection of electromagnetic radiation. There are also Radio telescope and X-ray and gamma ray telescope. We have used this to learn more science and expand our knowledge about the outside world. Scientist continue to use this so we can gather more information about this planets and as well as others. There are also microscopes that can see bacteria etc... We now know more information about our world than ever before and we will continue to learn more. Telescope has been a major factor to our education. 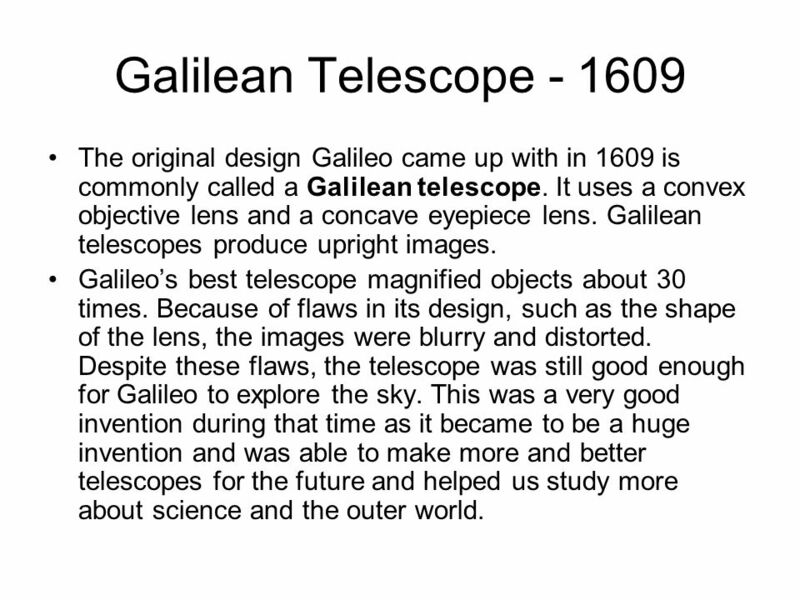 6 Galilean Telescope - 1609 The original design Galileo came up with in 1609 is commonly called a Galilean telescope. It uses a convex objective lens and a concave eyepiece lens. Galilean telescopes produce upright images. Galileo’s best telescope magnified objects about 30 times. Because of flaws in its design, such as the shape of the lens, the images were blurry and distorted. Despite these flaws, the telescope was still good enough for Galileo to explore the sky. This was a very good invention during that time as it became to be a huge invention and was able to make more and better telescopes for the future and helped us study more about science and the outer world. 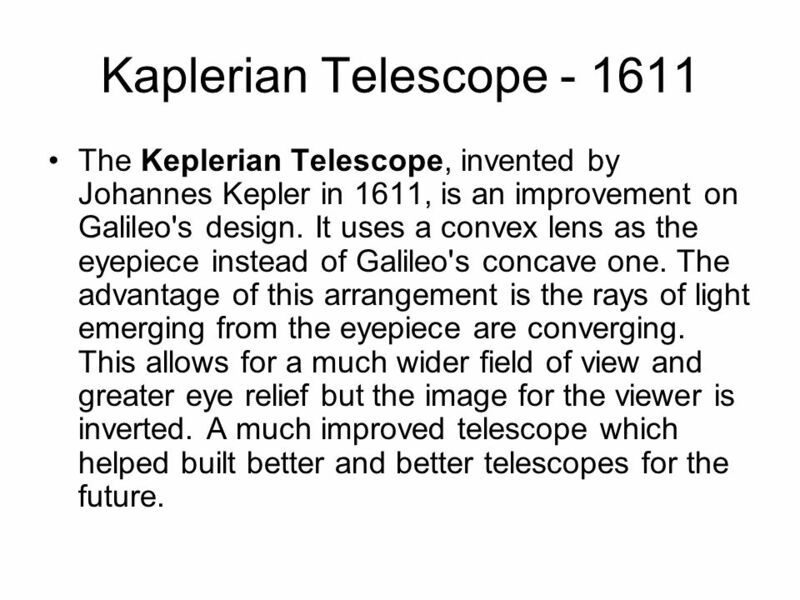 7 Kaplerian Telescope - 1611 The Keplerian Telescope, invented by Johannes Kepler in 1611, is an improvement on Galileo's design. It uses a convex lens as the eyepiece instead of Galileo's concave one. The advantage of this arrangement is the rays of light emerging from the eyepiece are converging. This allows for a much wider field of view and greater eye relief but the image for the viewer is inverted. A much improved telescope which helped built better and better telescopes for the future. 8 Cassegrain Telescopr - 1672 A Cassegrain telescope is a wide-angle reflecting telescope with a concave mirror that receives light and focuses an image. A second mirror reflects the light through a gap in the primary mirror, allowing the eyepiece or camera to be mounted at the back end of the tube. 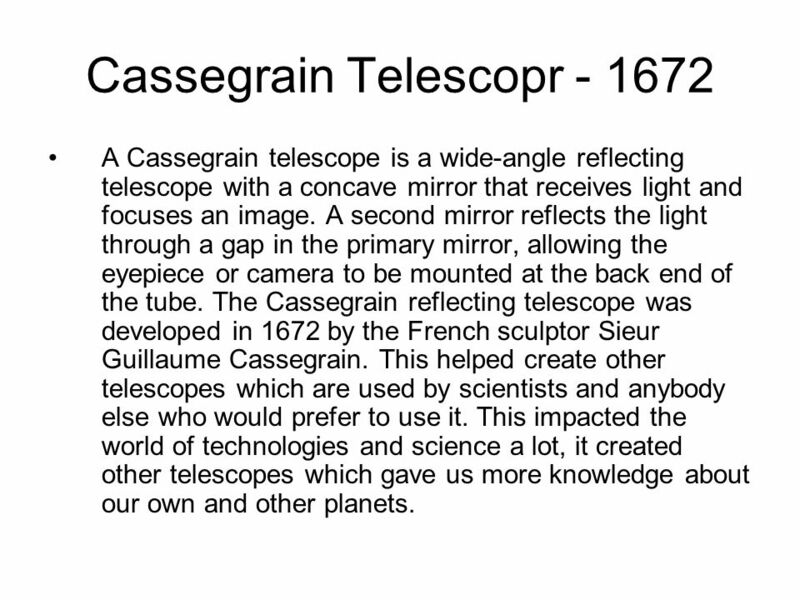 The Cassegrain reflecting telescope was developed in 1672 by the French sculptor Sieur Guillaume Cassegrain. This helped create other telescopes which are used by scientists and anybody else who would prefer to use it. This impacted the world of technologies and science a lot, it created other telescopes which gave us more knowledge about our own and other planets. 9 Camera - 1685 The first camera that was small and portable enough to be practical for photography was built by John Strognofe in 1685. A camera is a device that records images, either as a still photograph or as moving images known as videos or movies. Digital cameras are mostly used nowadays, instead of film. If it wasn’t for Camera, then we can’t use Television, it is used to capture images and display them. People also use it to create art, so it has made a huge impact on our world. 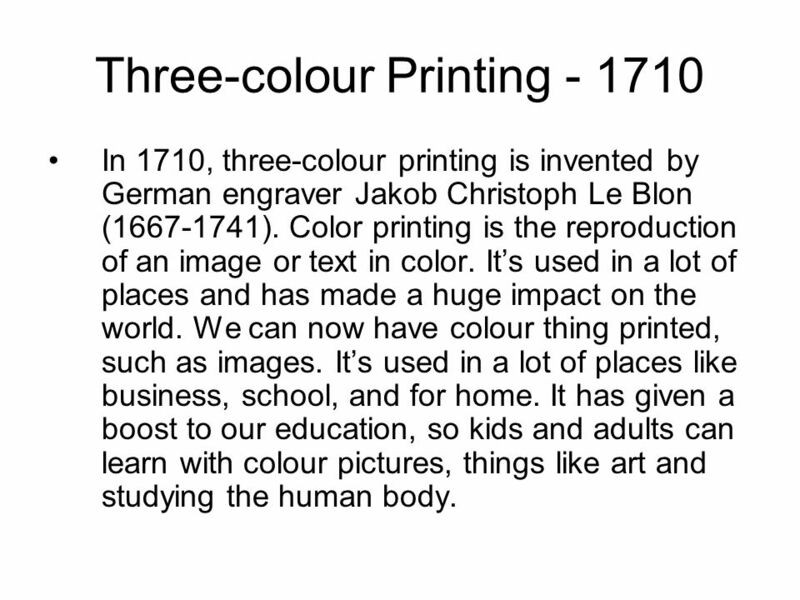 10 Three-colour Printing - 1710 In 1710, three-colour printing is invented by German engraver Jakob Christoph Le Blon (1667-1741). Color printing is the reproduction of an image or text in color. It’s used in a lot of places and has made a huge impact on the world. We can now have colour thing printed, such as images. It’s used in a lot of places like business, school, and for home. It has given a boost to our education, so kids and adults can learn with colour pictures, things like art and studying the human body. 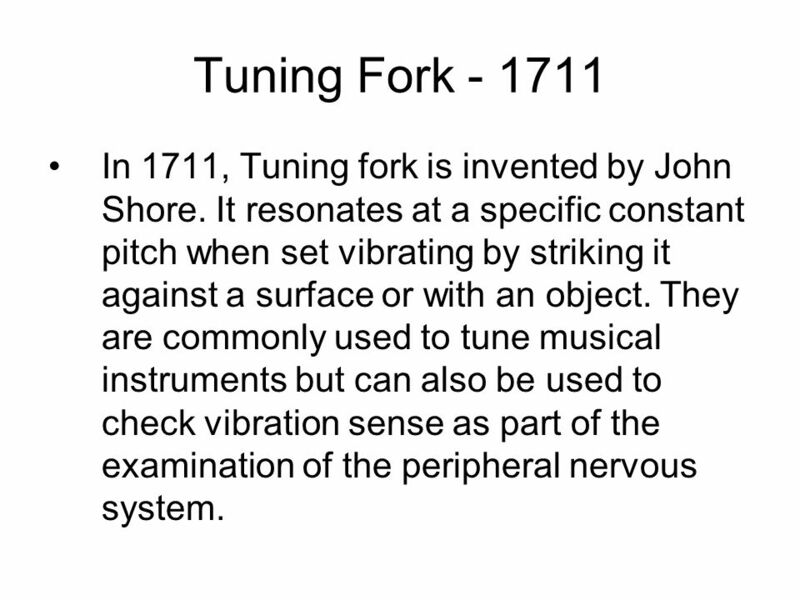 11 Tuning Fork - 1711 In 1711, Tuning fork is invented by John Shore. It resonates at a specific constant pitch when set vibrating by striking it against a surface or with an object. They are commonly used to tune musical instruments but can also be used to check vibration sense as part of the examination of the peripheral nervous system. 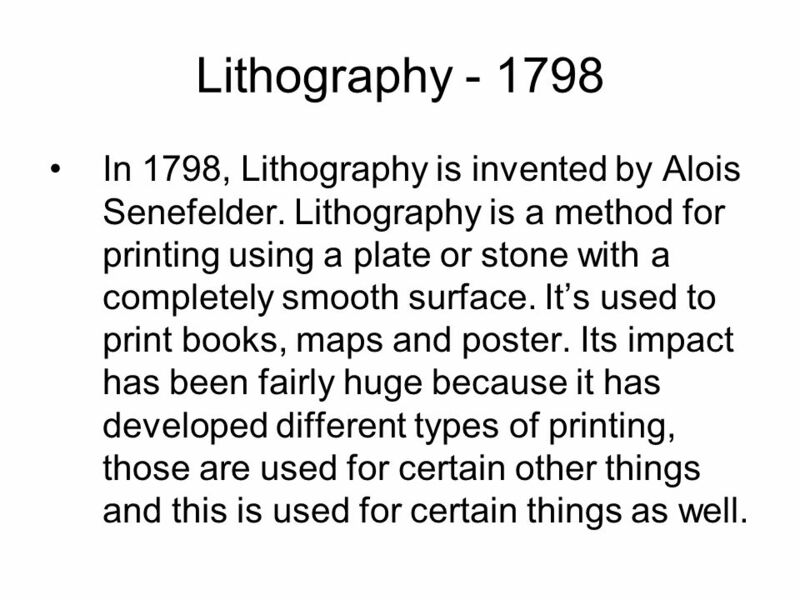 12 Lithography - 1798 In 1798, Lithography is invented by Alois Senefelder. Lithography is a method for printing using a plate or stone with a completely smooth surface. It’s used to print books, maps and poster. Its impact has been fairly huge because it has developed different types of printing, those are used for certain other things and this is used for certain things as well. 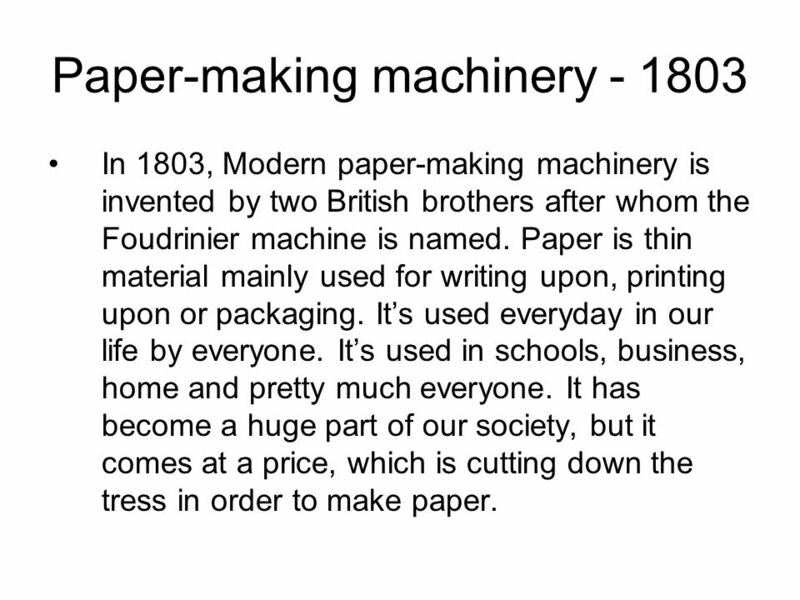 13 Paper-making machinery - 1803 In 1803, Modern paper-making machinery is invented by two British brothers after whom the Foudrinier machine is named. Paper is thin material mainly used for writing upon, printing upon or packaging. It’s used everyday in our life by everyone. It’s used in schools, business, home and pretty much everyone. It has become a huge part of our society, but it comes at a price, which is cutting down the tress in order to make paper. 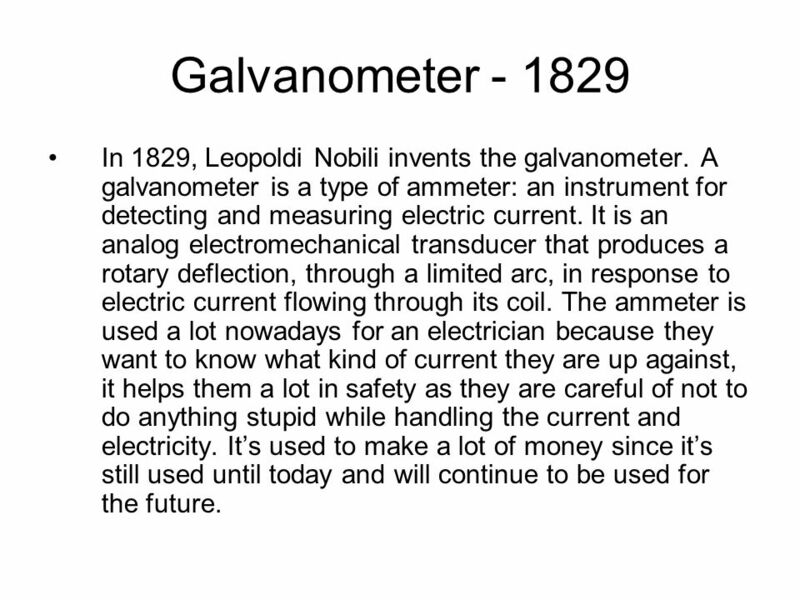 14 Galvanometer - 1829 In 1829, Leopoldi Nobili invents the galvanometer. A galvanometer is a type of ammeter: an instrument for detecting and measuring electric current. It is an analog electromechanical transducer that produces a rotary deflection, through a limited arc, in response to electric current flowing through its coil. The ammeter is used a lot nowadays for an electrician because they want to know what kind of current they are up against, it helps them a lot in safety as they are careful of not to do anything stupid while handling the current and electricity. It’s used to make a lot of money since it’s still used until today and will continue to be used for the future. 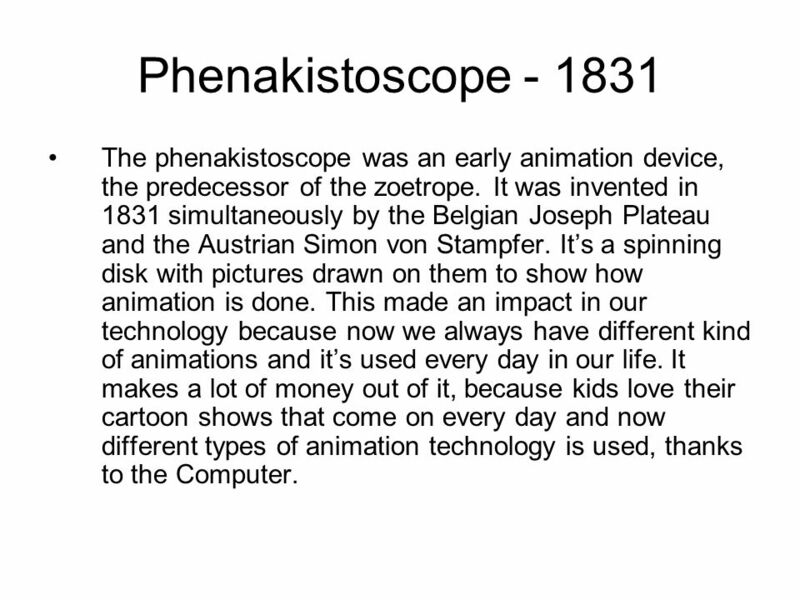 15 Phenakistoscope - 1831 The phenakistoscope was an early animation device, the predecessor of the zoetrope. It was invented in 1831 simultaneously by the Belgian Joseph Plateau and the Austrian Simon von Stampfer. It’s a spinning disk with pictures drawn on them to show how animation is done. This made an impact in our technology because now we always have different kind of animations and it’s used every day in our life. It makes a lot of money out of it, because kids love their cartoon shows that come on every day and now different types of animation technology is used, thanks to the Computer. 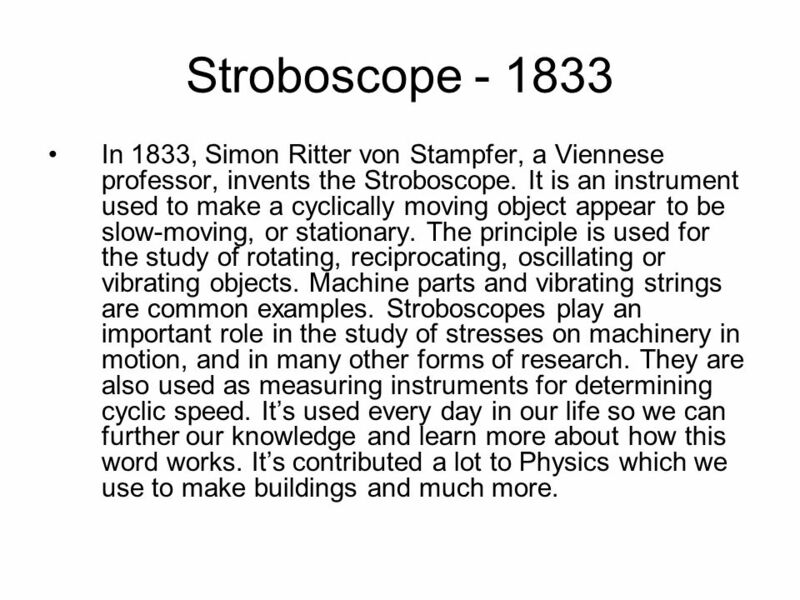 16 Stroboscope - 1833 In 1833, Simon Ritter von Stampfer, a Viennese professor, invents the Stroboscope. It is an instrument used to make a cyclically moving object appear to be slow-moving, or stationary. The principle is used for the study of rotating, reciprocating, oscillating or vibrating objects. Machine parts and vibrating strings are common examples. Stroboscopes play an important role in the study of stresses on machinery in motion, and in many other forms of research. They are also used as measuring instruments for determining cyclic speed. It’s used every day in our life so we can further our knowledge and learn more about how this word works. It’s contributed a lot to Physics which we use to make buildings and much more. 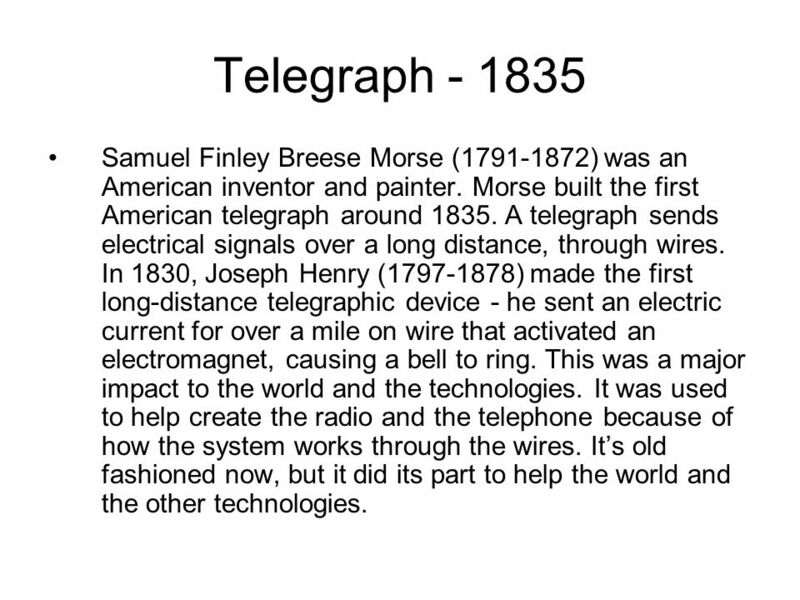 17 Telegraph - 1835 Samuel Finley Breese Morse (1791-1872) was an American inventor and painter. Morse built the first American telegraph around 1835. A telegraph sends electrical signals over a long distance, through wires. In 1830, Joseph Henry (1797-1878) made the first long-distance telegraphic device - he sent an electric current for over a mile on wire that activated an electromagnet, causing a bell to ring. This was a major impact to the world and the technologies. It was used to help create the radio and the telephone because of how the system works through the wires. It’s old fashioned now, but it did its part to help the world and the other technologies. 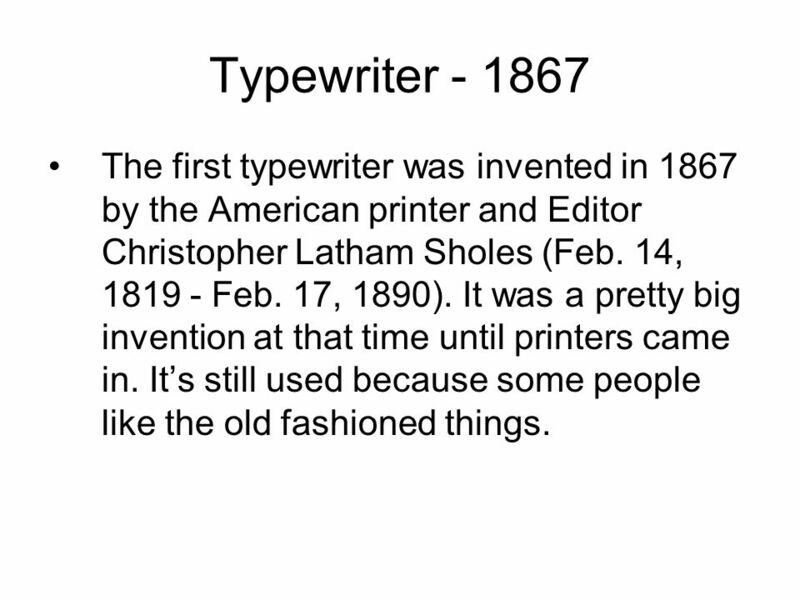 18 Typewriter - 1867 The first typewriter was invented in 1867 by the American printer and Editor Christopher Latham Sholes (Feb. 14, 1819 - Feb. 17, 1890). It was a pretty big invention at that time until printers came in. It’s still used because some people like the old fashioned things. 19 Quadruplex Telegraph - 1874 Quadruplex Telegraph - In 1874, Thomas Edison invented the first Quadruplex telegraph, which was capable of sending two messages simultaneously in each direction. 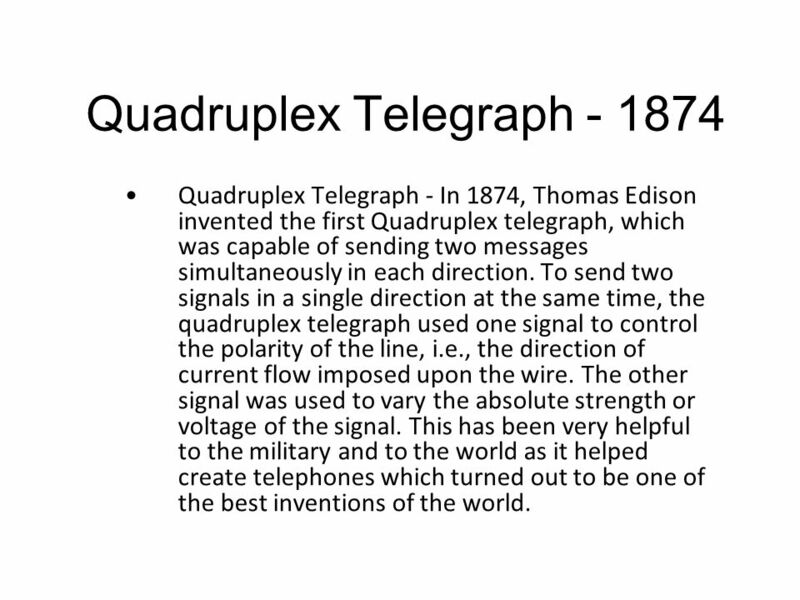 To send two signals in a single direction at the same time, the quadruplex telegraph used one signal to control the polarity of the line, i.e., the direction of current flow imposed upon the wire. The other signal was used to vary the absolute strength or voltage of the signal. This has been very helpful to the military and to the world as it helped create telephones which turned out to be one of the best inventions of the world. 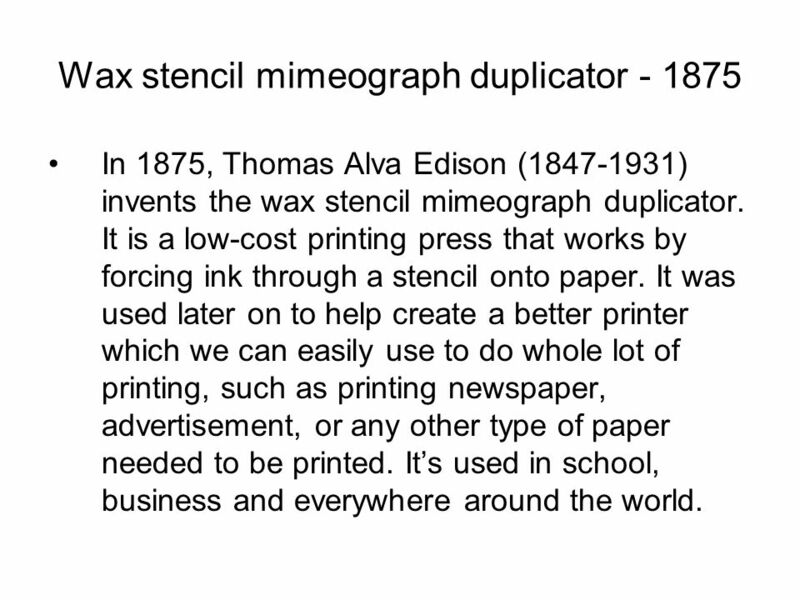 20 Wax stencil mimeograph duplicator - 1875 In 1875, Thomas Alva Edison (1847-1931) invents the wax stencil mimeograph duplicator. It is a low-cost printing press that works by forcing ink through a stencil onto paper. It was used later on to help create a better printer which we can easily use to do whole lot of printing, such as printing newspaper, advertisement, or any other type of paper needed to be printed. It’s used in school, business and everywhere around the world. 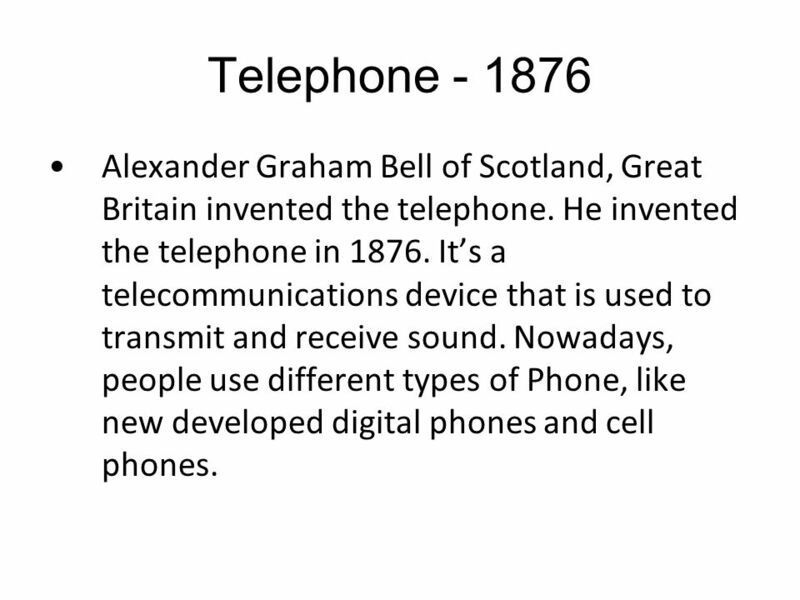 21 Telephone - 1876 Alexander Graham Bell of Scotland, Great Britain invented the telephone. He invented the telephone in 1876. It’s a telecommunications device that is used to transmit and receive sound. Nowadays, people use different types of Phone, like new developed digital phones and cell phones. 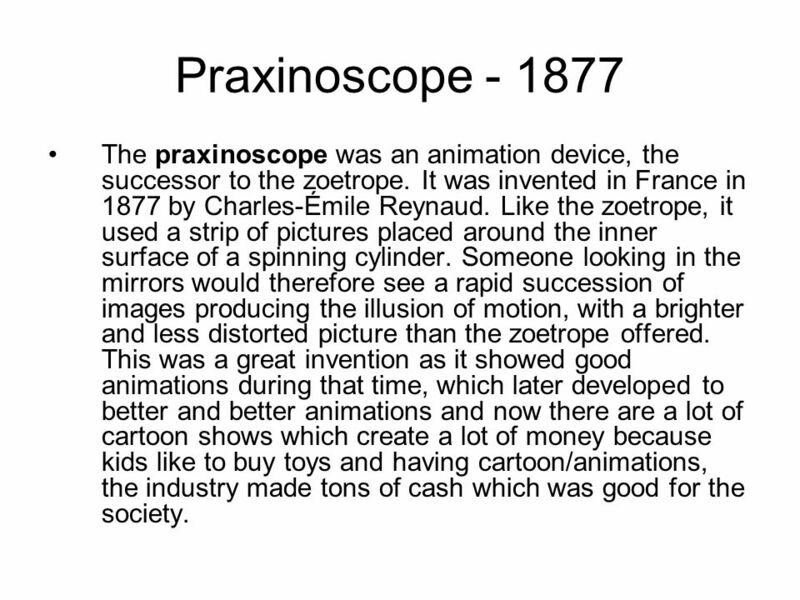 22 Praxinoscope - 1877 The praxinoscope was an animation device, the successor to the zoetrope. It was invented in France in 1877 by Charles-Émile Reynaud. Like the zoetrope, it used a strip of pictures placed around the inner surface of a spinning cylinder. Someone looking in the mirrors would therefore see a rapid succession of images producing the illusion of motion, with a brighter and less distorted picture than the zoetrope offered. This was a great invention as it showed good animations during that time, which later developed to better and better animations and now there are a lot of cartoon shows which create a lot of money because kids like to buy toys and having cartoon/animations, the industry made tons of cash which was good for the society. 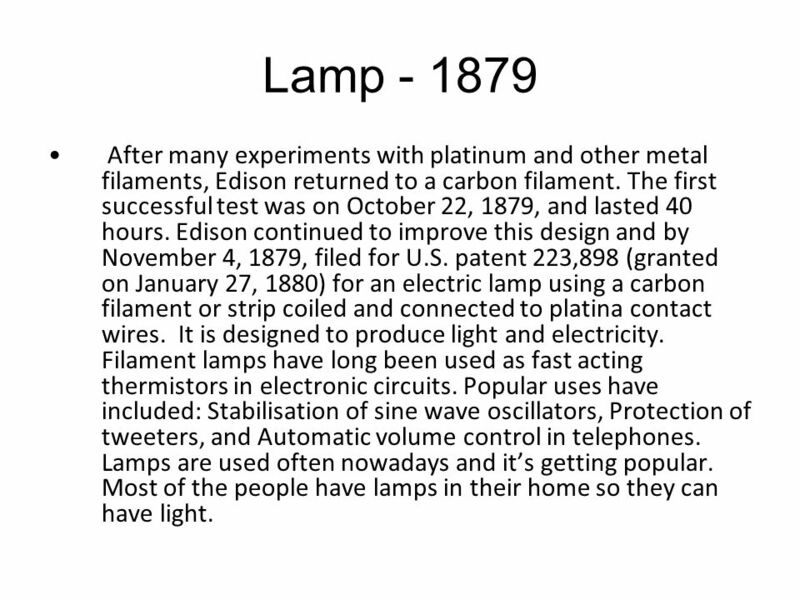 23 Lamp - 1879 After many experiments with platinum and other metal filaments, Edison returned to a carbon filament. The first successful test was on October 22, 1879, and lasted 40 hours. Edison continued to improve this design and by November 4, 1879, filed for U.S. patent 223,898 (granted on January 27, 1880) for an electric lamp using a carbon filament or strip coiled and connected to platina contact wires. It is designed to produce light and electricity. Filament lamps have long been used as fast acting thermistors in electronic circuits. Popular uses have included: Stabilisation of sine wave oscillators, Protection of tweeters, and Automatic volume control in telephones. Lamps are used often nowadays and it’s getting popular. Most of the people have lamps in their home so they can have light. 24 Cash Register - 1879 The mechanical cash register was invented (and patented) in 1879 by James Ritty (1836- 1918). Ritty was an American tavern keeper in Dayton, Ohio. 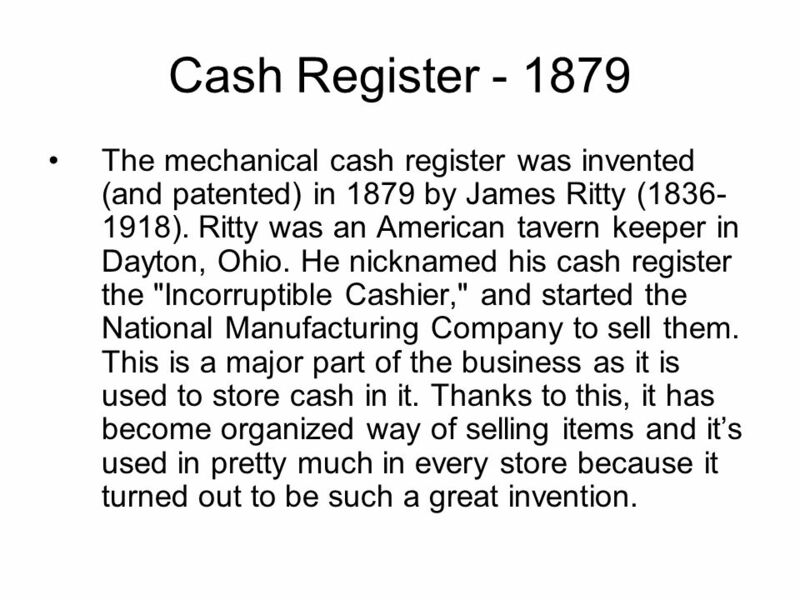 He nicknamed his cash register the "Incorruptible Cashier," and started the National Manufacturing Company to sell them. This is a major part of the business as it is used to store cash in it. Thanks to this, it has become organized way of selling items and it’s used in pretty much in every store because it turned out to be such a great invention. 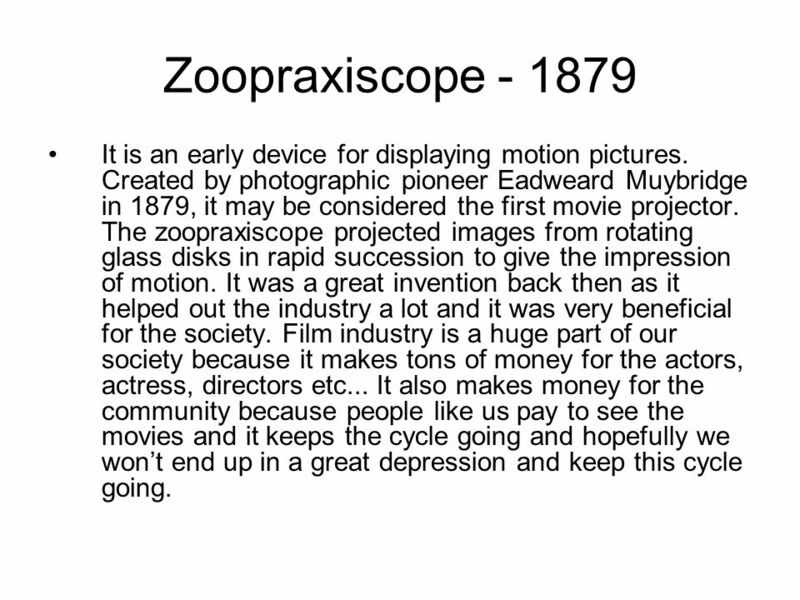 25 Zoopraxiscope - 1879 It is an early device for displaying motion pictures. Created by photographic pioneer Eadweard Muybridge in 1879, it may be considered the first movie projector. The zoopraxiscope projected images from rotating glass disks in rapid succession to give the impression of motion. It was a great invention back then as it helped out the industry a lot and it was very beneficial for the society. Film industry is a huge part of our society because it makes tons of money for the actors, actress, directors etc... It also makes money for the community because people like us pay to see the movies and it keeps the cycle going and hopefully we won’t end up in a great depression and keep this cycle going. 26 Gyrocompass - 1885 A gyrocompass is similar to a gyroscope. It is a compass that finds true north by using an (electrically powered) fast-spinning wheel and friction forces in order to exploit the rotation of the Earth. Gyrocompasses are widely used on ships. They have two main advantages over magnetic compasses: they find true north, i.e., the direction of Earth's rotational axis, as opposed to magnetic north, they are far less susceptible to external magnetic fields, e.g. those created by ferrous metal in a ship's hull. 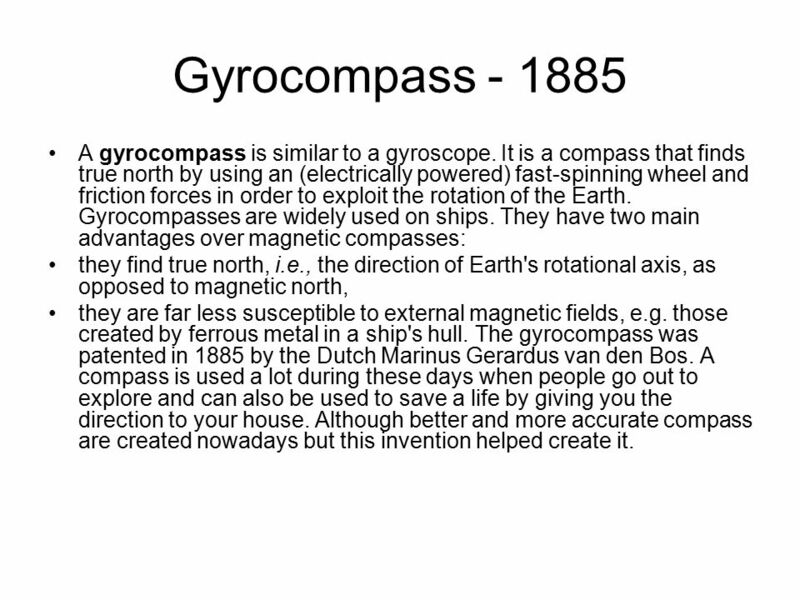 The gyrocompass was patented in 1885 by the Dutch Marinus Gerardus van den Bos. A compass is used a lot during these days when people go out to explore and can also be used to save a life by giving you the direction to your house. Although better and more accurate compass are created nowadays but this invention helped create it. 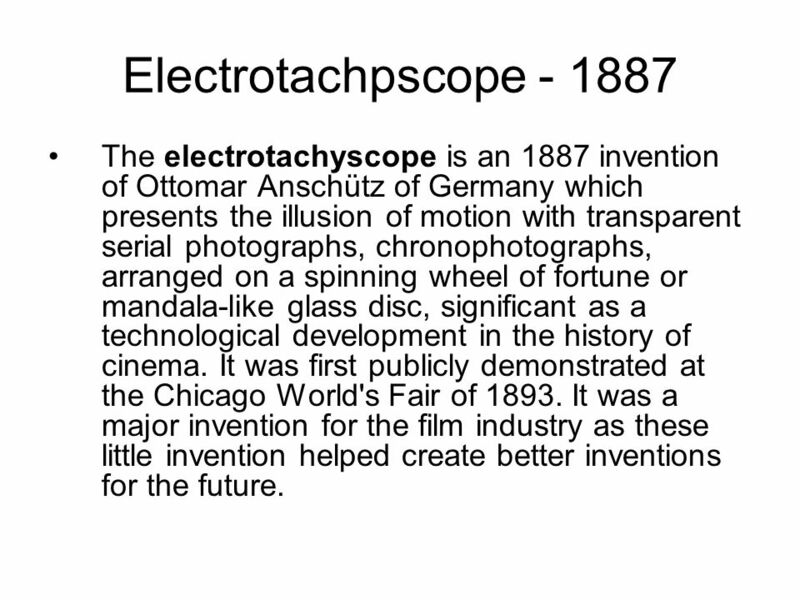 27 Electrotachpscope - 1887 The electrotachyscope is an 1887 invention of Ottomar Anschütz of Germany which presents the illusion of motion with transparent serial photographs, chronophotographs, arranged on a spinning wheel of fortune or mandala-like glass disc, significant as a technological development in the history of cinema. It was first publicly demonstrated at the Chicago World's Fair of 1893. It was a major invention for the film industry as these little invention helped create better inventions for the future. 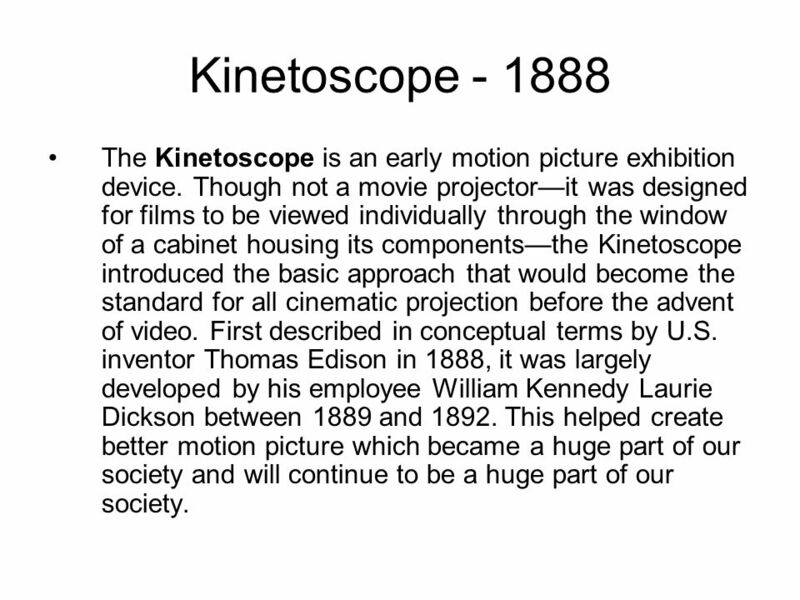 28 Kinetoscope - 1888 The Kinetoscope is an early motion picture exhibition device. Though not a movie projector—it was designed for films to be viewed individually through the window of a cabinet housing its components—the Kinetoscope introduced the basic approach that would become the standard for all cinematic projection before the advent of video. First described in conceptual terms by U.S. inventor Thomas Edison in 1888, it was largely developed by his employee William Kennedy Laurie Dickson between 1889 and 1892. This helped create better motion picture which became a huge part of our society and will continue to be a huge part of our society. 29 Cinematography- 1890 The cinematograph is a film camera, which also serves as a film projector and developer. It was invented in the 1890s. 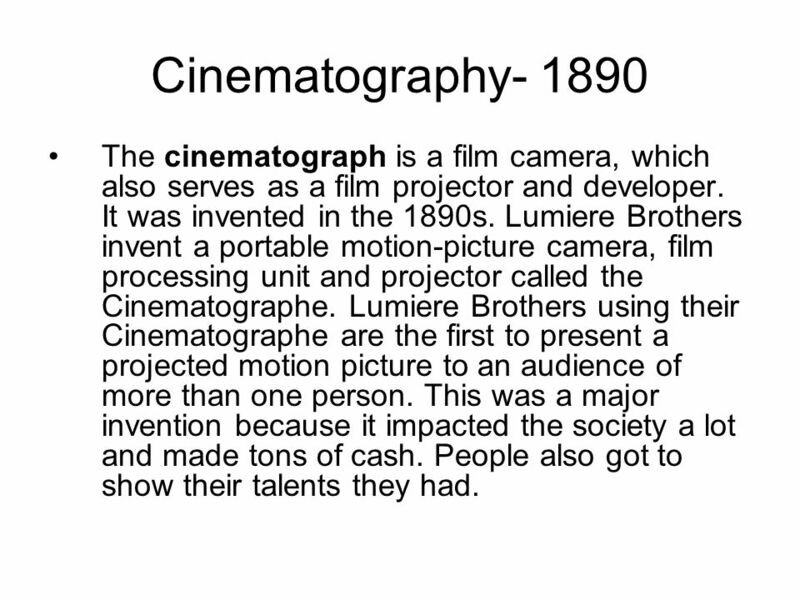 Lumiere Brothers invent a portable motion-picture camera, film processing unit and projector called the Cinematographe. Lumiere Brothers using their Cinematographe are the first to present a projected motion picture to an audience of more than one person. This was a major invention because it impacted the society a lot and made tons of cash. People also got to show their talents they had. 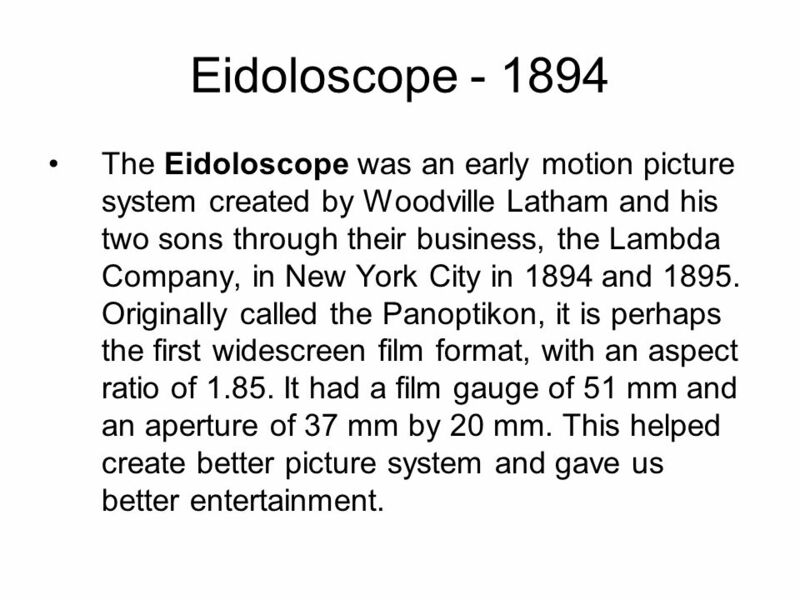 30 Eidoloscope - 1894 The Eidoloscope was an early motion picture system created by Woodville Latham and his two sons through their business, the Lambda Company, in New York City in 1894 and 1895. Originally called the Panoptikon, it is perhaps the first widescreen film format, with an aspect ratio of 1.85. It had a film gauge of 51 mm and an aperture of 37 mm by 20 mm. This helped create better picture system and gave us better entertainment. 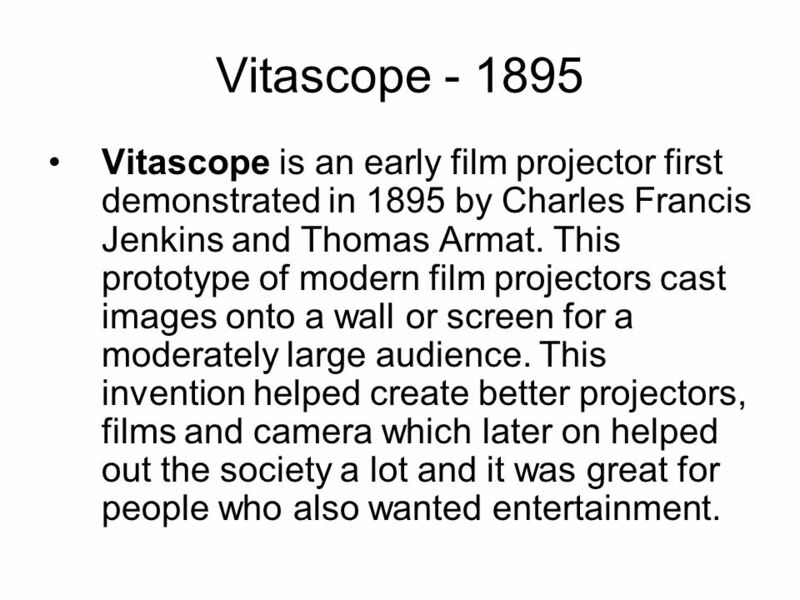 31 Vitascope - 1895 Vitascope is an early film projector first demonstrated in 1895 by Charles Francis Jenkins and Thomas Armat. This prototype of modern film projectors cast images onto a wall or screen for a moderately large audience. This invention helped create better projectors, films and camera which later on helped out the society a lot and it was great for people who also wanted entertainment. 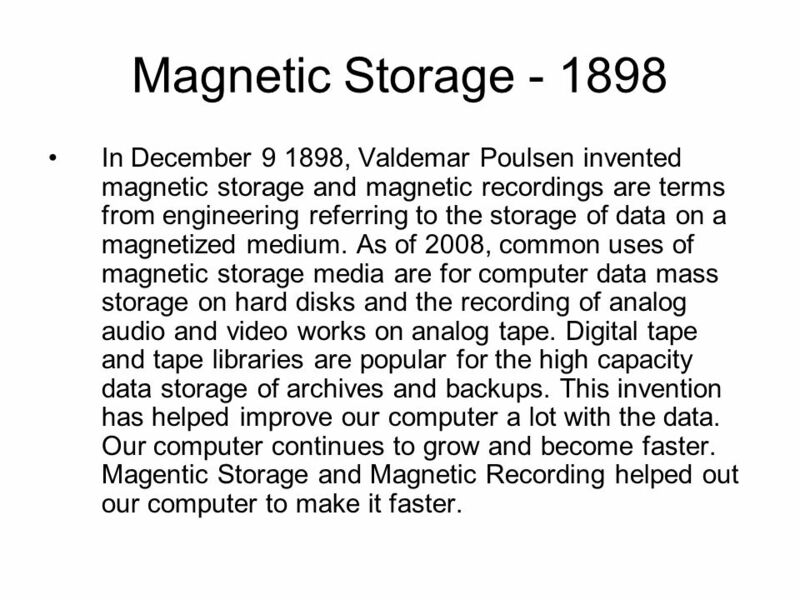 32 Magnetic Storage - 1898 In December 9 1898, Valdemar Poulsen invented magnetic storage and magnetic recordings are terms from engineering referring to the storage of data on a magnetized medium. As of 2008, common uses of magnetic storage media are for computer data mass storage on hard disks and the recording of analog audio and video works on analog tape. Digital tape and tape libraries are popular for the high capacity data storage of archives and backups. This invention has helped improve our computer a lot with the data. Our computer continues to grow and become faster. Magentic Storage and Magnetic Recording helped out our computer to make it faster. 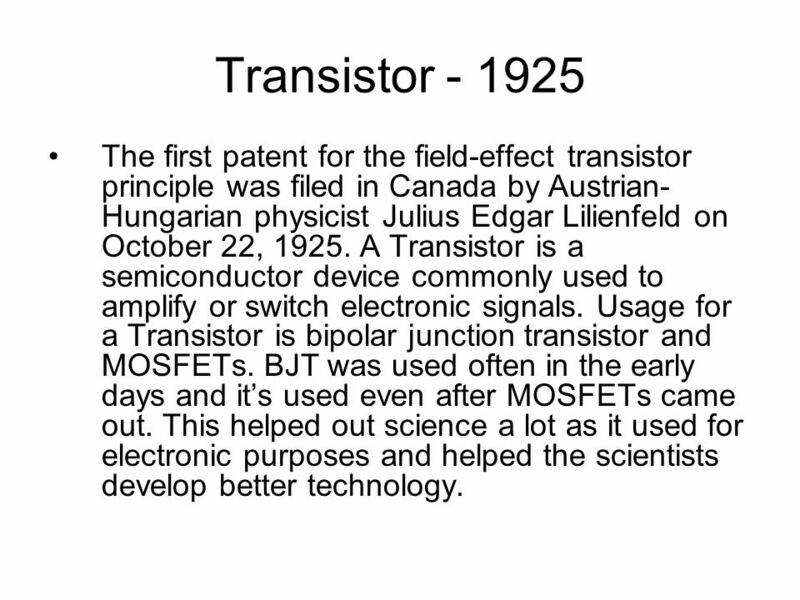 33 Transistor - 1925 The first patent for the field-effect transistor principle was filed in Canada by Austrian- Hungarian physicist Julius Edgar Lilienfeld on October 22, 1925. A Transistor is a semiconductor device commonly used to amplify or switch electronic signals. Usage for a Transistor is bipolar junction transistor and MOSFETs. BJT was used often in the early days and it’s used even after MOSFETs came out. This helped out science a lot as it used for electronic purposes and helped the scientists develop better technology. 34 Electron Microscope - 1931 An electron microscope is a type of microscope that uses a particle beam of electrons to illuminate a specimen and create a highly-magnified image. Electron microscopes have much greater resolving power than light microscopes that use electromagnetic radiation and can obtain much higher magnifications of up to 2 million times. 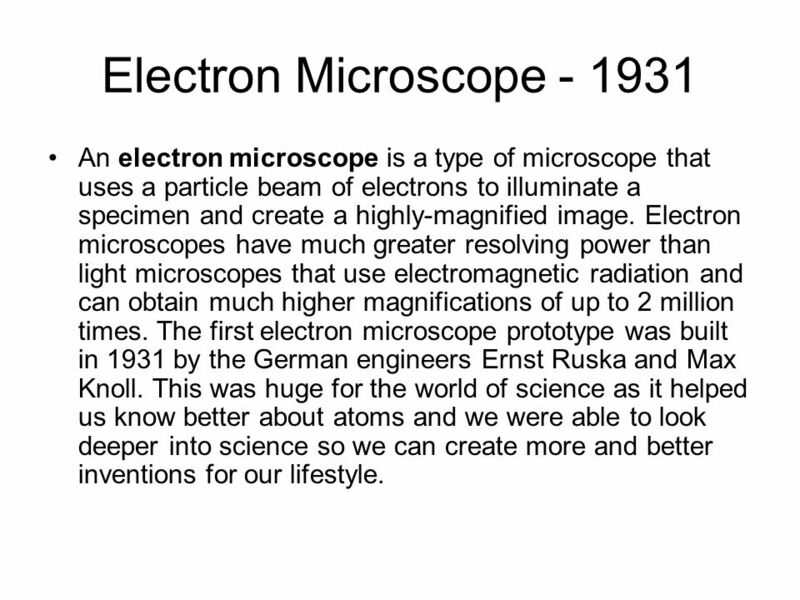 The first electron microscope prototype was built in 1931 by the German engineers Ernst Ruska and Max Knoll. This was huge for the world of science as it helped us know better about atoms and we were able to look deeper into science so we can create more and better inventions for our lifestyle. 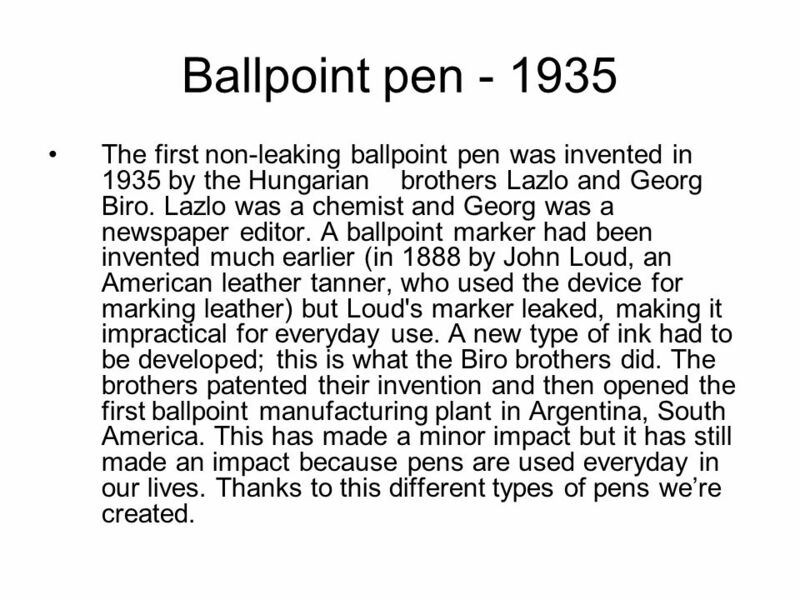 35 Ballpoint pen - 1935 The first non-leaking ballpoint pen was invented in 1935 by the Hungarian brothers Lazlo and Georg Biro. Lazlo was a chemist and Georg was a newspaper editor. A ballpoint marker had been invented much earlier (in 1888 by John Loud, an American leather tanner, who used the device for marking leather) but Loud's marker leaked, making it impractical for everyday use. A new type of ink had to be developed; this is what the Biro brothers did. The brothers patented their invention and then opened the first ballpoint manufacturing plant in Argentina, South America. This has made a minor impact but it has still made an impact because pens are used everyday in our lives. Thanks to this different types of pens we’re created. 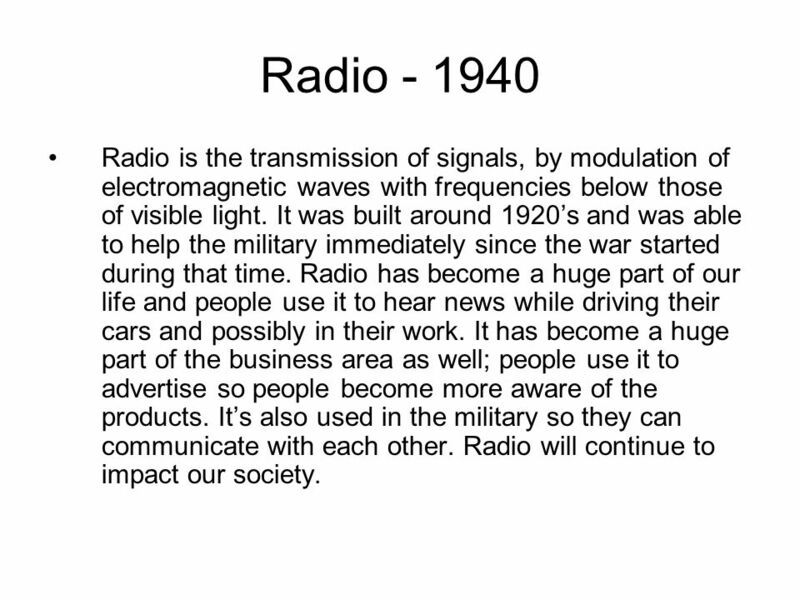 36 Radio - 1940 Radio is the transmission of signals, by modulation of electromagnetic waves with frequencies below those of visible light. It was built around 1920’s and was able to help the military immediately since the war started during that time. Radio has become a huge part of our life and people use it to hear news while driving their cars and possibly in their work. It has become a huge part of the business area as well; people use it to advertise so people become more aware of the products. It’s also used in the military so they can communicate with each other. Radio will continue to impact our society. 37 X-Ray Microscope - 1940 An X-ray microscope uses electromagnetic radiation in the soft X-ray band to produce images of very small objects. 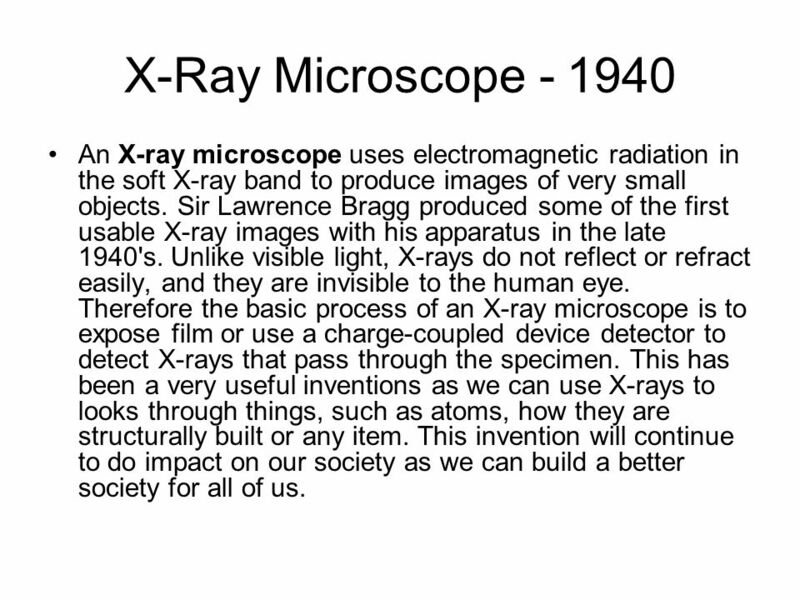 Sir Lawrence Bragg produced some of the first usable X-ray images with his apparatus in the late 1940's. Unlike visible light, X-rays do not reflect or refract easily, and they are invisible to the human eye. Therefore the basic process of an X-ray microscope is to expose film or use a charge-coupled device detector to detect X-rays that pass through the specimen. This has been a very useful inventions as we can use X-rays to looks through things, such as atoms, how they are structurally built or any item. This invention will continue to do impact on our society as we can build a better society for all of us. 38 Liquid Paper - 1951 Liquid Paper is a quick-drying, paper- colored (white) liquid that is painted onto paper to correct printed material. 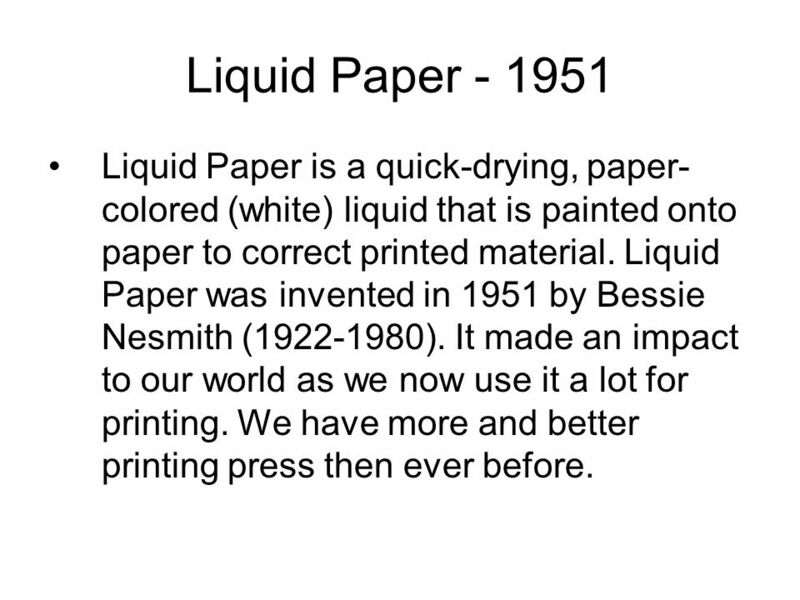 Liquid Paper was invented in 1951 by Bessie Nesmith (1922-1980). It made an impact to our world as we now use it a lot for printing. We have more and better printing press then ever before. 39 Catadioptric Telescope - 1960 A catadioptric optical system is one where lenses and curved mirrors are used to form the Image-forming optical system. 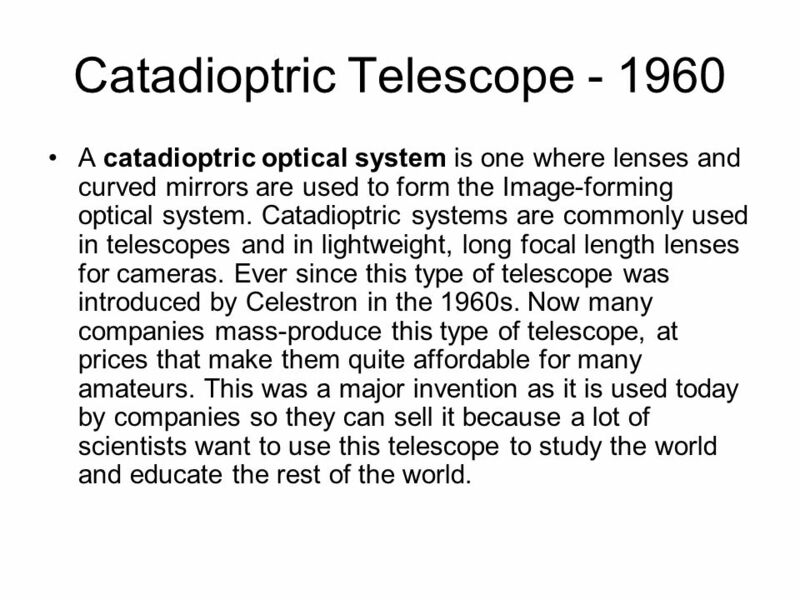 Catadioptric systems are commonly used in telescopes and in lightweight, long focal length lenses for cameras. Ever since this type of telescope was introduced by Celestron in the 1960s. Now many companies mass-produce this type of telescope, at prices that make them quite affordable for many amateurs. This was a major invention as it is used today by companies so they can sell it because a lot of scientists want to use this telescope to study the world and educate the rest of the world. 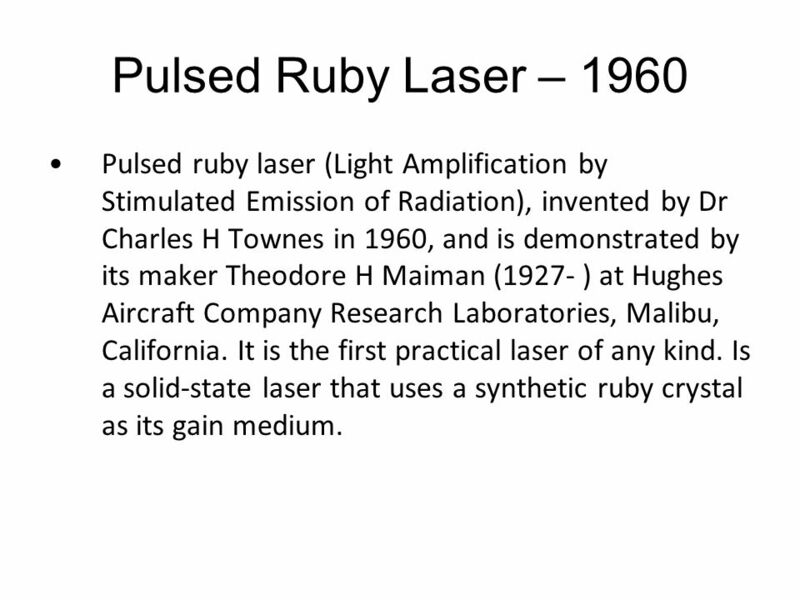 40 Pulsed Ruby Laser – 1960 Pulsed ruby laser (Light Amplification by Stimulated Emission of Radiation), invented by Dr Charles H Townes in 1960, and is demonstrated by its maker Theodore H Maiman (1927- ) at Hughes Aircraft Company Research Laboratories, Malibu, California. It is the first practical laser of any kind. Is a solid-state laser that uses a synthetic ruby crystal as its gain medium. 41 Fluorescence Microscope A fluorescence microscope is a light microscope used to study properties of organic or inorganic substances using the phenomena of fluorescence and phosphorescence instead of, or in addition to, reflection and absorption. This was a major invention as the scientists were able to look deeper and better for the science. The scientists have been able to do more and accurate experiments to build new things which will help us out in the future. 42 Radio Telescope A radio telescope is a metal dish that gathers radio waves from space. 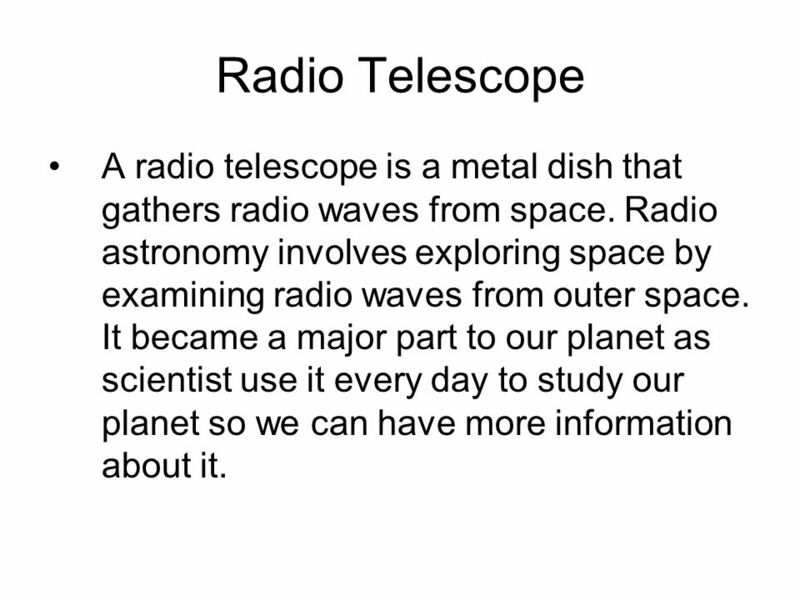 Radio astronomy involves exploring space by examining radio waves from outer space. It became a major part to our planet as scientist use it every day to study our planet so we can have more information about it. 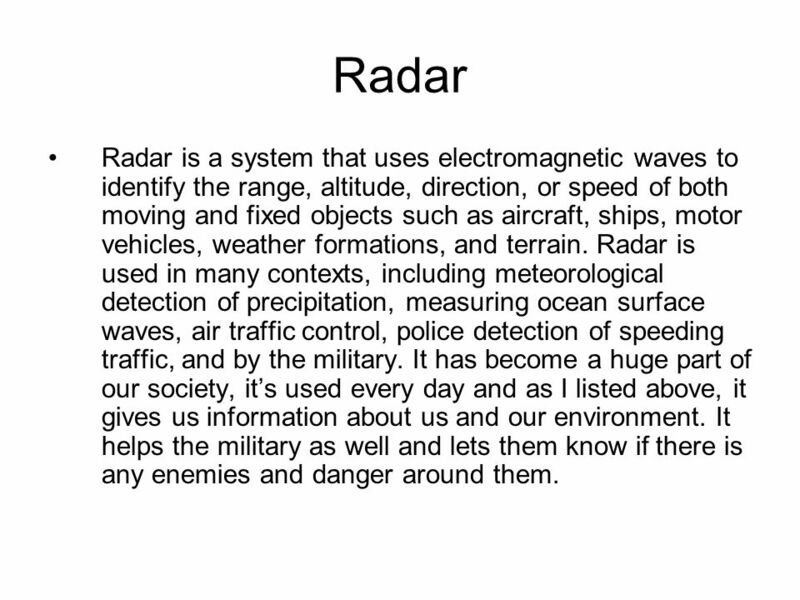 43 Radar Radar is a system that uses electromagnetic waves to identify the range, altitude, direction, or speed of both moving and fixed objects such as aircraft, ships, motor vehicles, weather formations, and terrain. Radar is used in many contexts, including meteorological detection of precipitation, measuring ocean surface waves, air traffic control, police detection of speeding traffic, and by the military. It has become a huge part of our society, it’s used every day and as I listed above, it gives us information about us and our environment. It helps the military as well and lets them know if there is any enemies and danger around them. 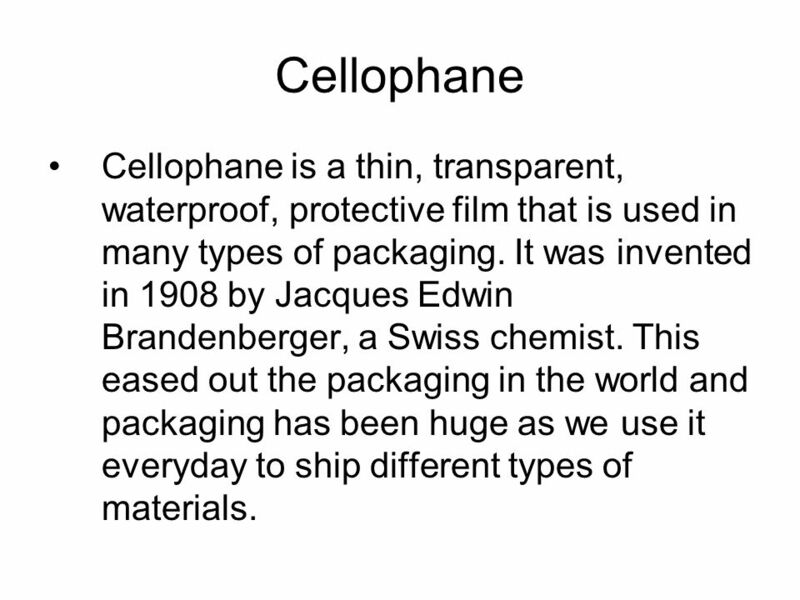 44 Cellophane Cellophane is a thin, transparent, waterproof, protective film that is used in many types of packaging. It was invented in 1908 by Jacques Edwin Brandenberger, a Swiss chemist. This eased out the packaging in the world and packaging has been huge as we use it everyday to ship different types of materials. 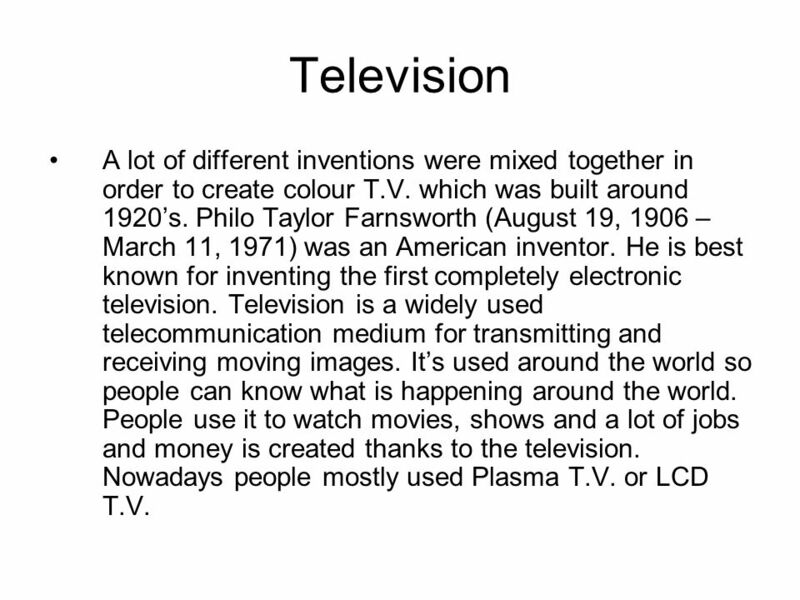 45 Television A lot of different inventions were mixed together in order to create colour T.V. which was built around 1920’s. Philo Taylor Farnsworth (August 19, 1906 – March 11, 1971) was an American inventor. He is best known for inventing the first completely electronic television. Television is a widely used telecommunication medium for transmitting and receiving moving images. It’s used around the world so people can know what is happening around the world. People use it to watch movies, shows and a lot of jobs and money is created thanks to the television. Nowadays people mostly used Plasma T.V. or LCD T.V. 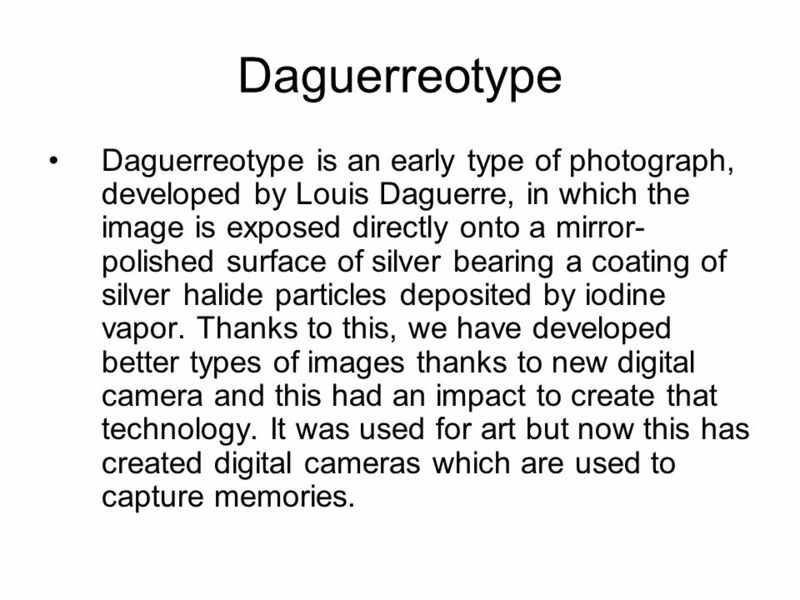 46 Daguerreotype Daguerreotype is an early type of photograph, developed by Louis Daguerre, in which the image is exposed directly onto a mirror- polished surface of silver bearing a coating of silver halide particles deposited by iodine vapor. 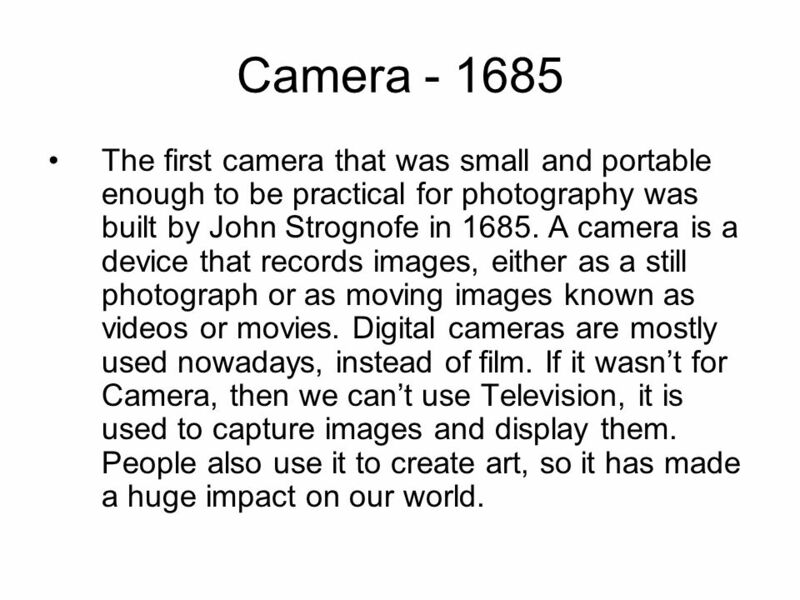 Thanks to this, we have developed better types of images thanks to new digital camera and this had an impact to create that technology. It was used for art but now this has created digital cameras which are used to capture memories. 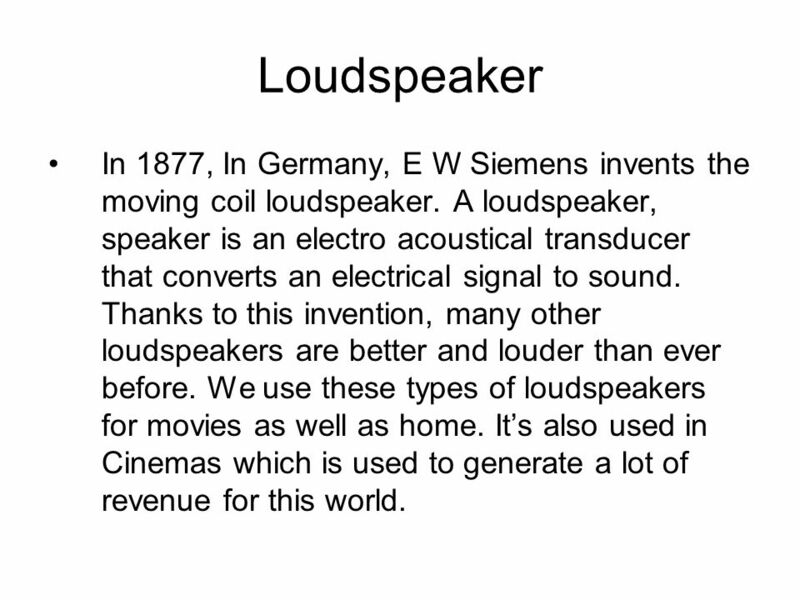 47 Loudspeaker In 1877, In Germany, E W Siemens invents the moving coil loudspeaker. A loudspeaker, speaker is an electro acoustical transducer that converts an electrical signal to sound. Thanks to this invention, many other loudspeakers are better and louder than ever before. We use these types of loudspeakers for movies as well as home. It’s also used in Cinemas which is used to generate a lot of revenue for this world. 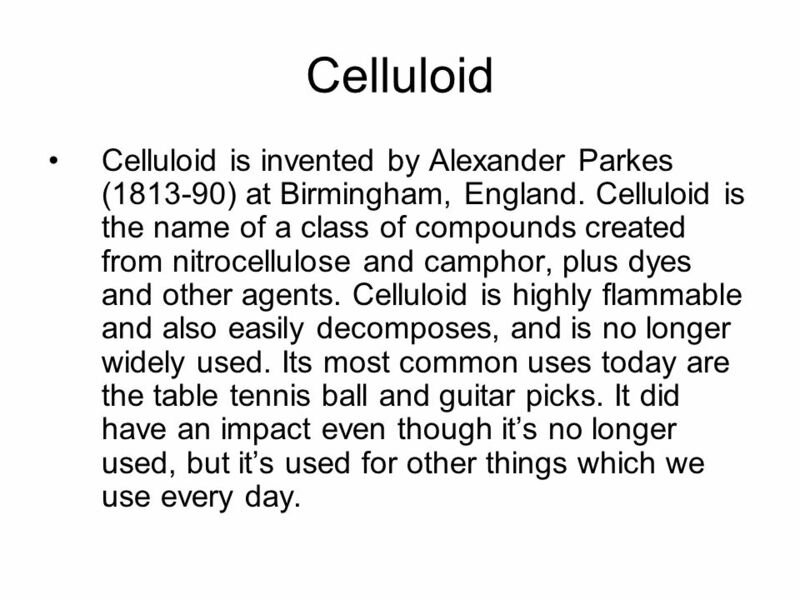 48 Celluloid Celluloid is invented by Alexander Parkes (1813-90) at Birmingham, England. Celluloid is the name of a class of compounds created from nitrocellulose and camphor, plus dyes and other agents. Celluloid is highly flammable and also easily decomposes, and is no longer widely used. Its most common uses today are the table tennis ball and guitar picks. It did have an impact even though it’s no longer used, but it’s used for other things which we use every day. 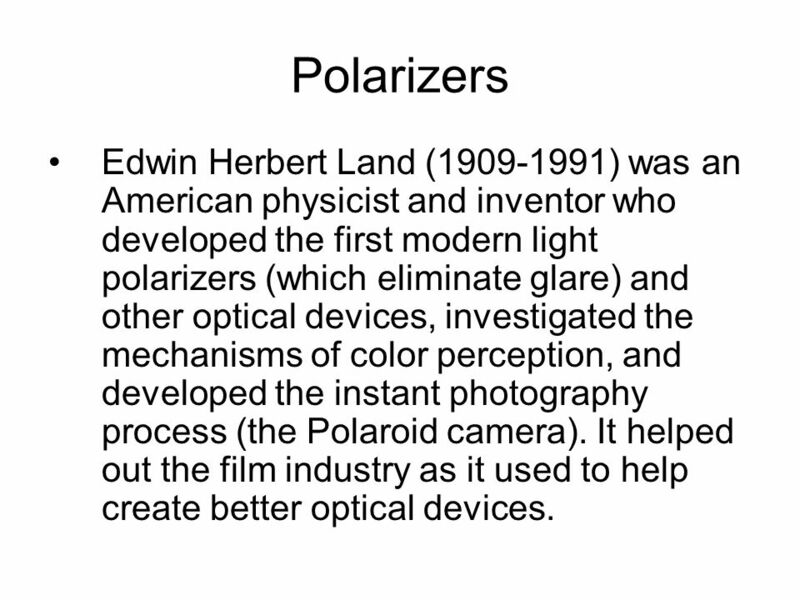 49 Polarizers Edwin Herbert Land (1909-1991) was an American physicist and inventor who developed the first modern light polarizers (which eliminate glare) and other optical devices, investigated the mechanisms of color perception, and developed the instant photography process (the Polaroid camera). It helped out the film industry as it used to help create better optical devices. 50 Refracting Telescope A refracting or refractor telescope is a dioptric telescope that uses a lens as its objective to form an image. The refracting telescope design was originally used in spy glasses and astronomical telescopes but is also used in other devices such as binoculars and long or telephoto camera lenses. Refractors were the earliest type of optical telescope. 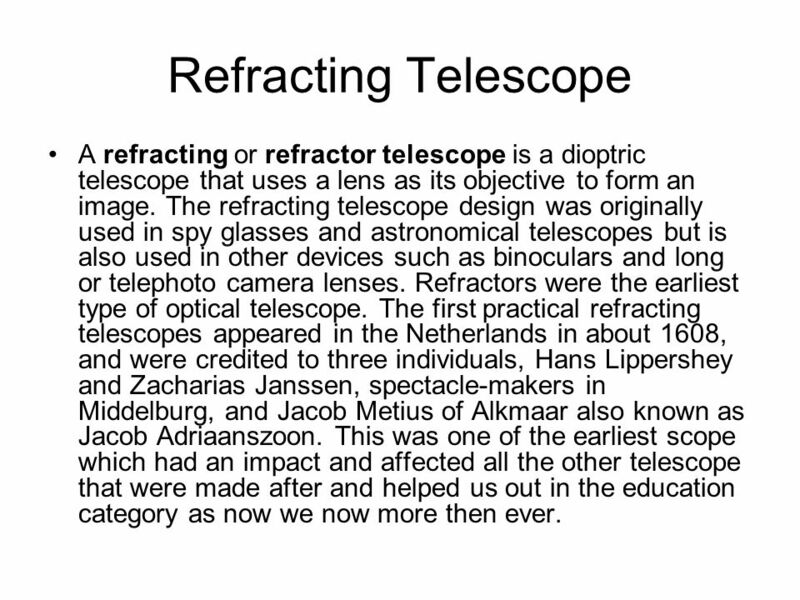 The first practical refracting telescopes appeared in the Netherlands in about 1608, and were credited to three individuals, Hans Lippershey and Zacharias Janssen, spectacle-makers in Middelburg, and Jacob Metius of Alkmaar also known as Jacob Adriaanszoon. This was one of the earliest scope which had an impact and affected all the other telescope that were made after and helped us out in the education category as now we now more then ever. Download ppt "Zoetrope – 180 AD A zoetrope is a device that produces an illusion of action from a rapid succession of static pictures. It consists of a cylinder with." HIGHER PHOTOGRAPHY UNIT 1: BASIC CAMERA TECHNIQUES The word Photography comes from the Greek word photos which means light and graphe which means to draw. This Set of Slides This set of slides deals with telescopes. Units covered: 26, 27, 28, 29, and 30. TELESCOPES. WHAT IS A TELESCOPE A telescope is an instrument that gathers electromagnetic radiation from objection in space and concentrates it for better. Spring 2006  Harvard Science, A 52 FHA+MBM Lecture 17 1 Motors, Electrical Devices, and Videos of Lighting and Wiring the Nation Science A 52 Lecture. Unit 1 Physics Detailed Study 3.1 Chapter 10: Astronomy. 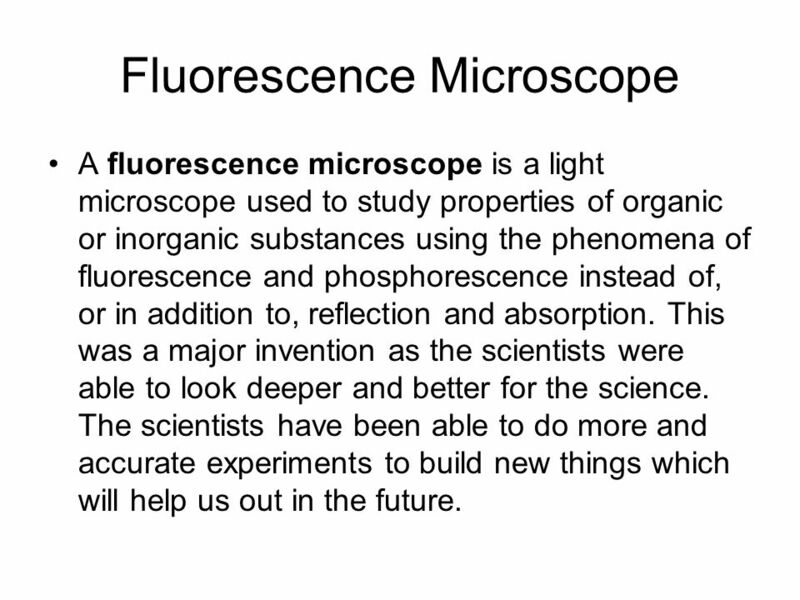 Unit 11 Lesson 5 Light Technology Copyright © Houghton Mifflin Harcourt Publishing Company. TELECOMMUNICATIONS –Communication over a long distance; deals with devices used to transmit and receive messages over a distance. –Examples: Telegraph. Chapter 6: The Tools of the Astronomer. Telescopes come in two general types Refractors use lenses to bend the light to a focus Reflectors use mirrors. < BackNext >PreviewMain Section 1 Mirrors and Lenses Rays and the Path of Light Waves Because light waves travel in straight lines, you can use an arrow. By: Lauren Carter.  The first machine patented in the United States that showed animated pictures or movies was a device called the "wheel of life" or.